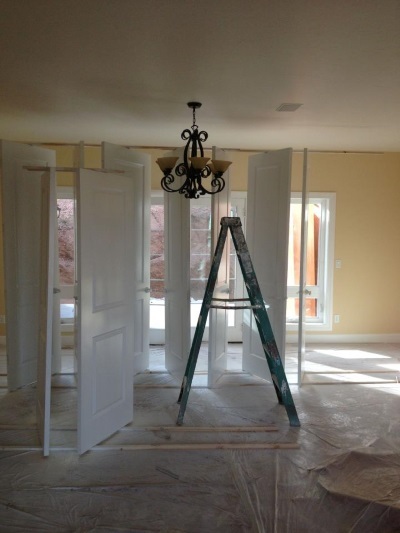 Choosing the right paint finish for your home is critical. It is important to look at the way the finish reacts to light when selecting the product you want to use. Also, there are durability considerations as paint finishes move from flat to a full gloss, with flat being the least durable and a gloss finish the most. Let’s go over your different finish options if you used latex paint since this is the most common type of paint used for interior decoration. You won’t have any sheen once the paint is dry if you used a flat paint finish. Light is absorbed by this finish and is not reflected well, making the surface appear dull. A flat paint finish is an excellent choice if there are small imperfections on the walls since these flaws will be hidden. This type of finish works with any paint color, but it is best to use flat paint finish in low traffic areas like your bedroom or a closet. The downside of flat paint finish is that it is not easy to clean, which doesn’t make it ideal for a kitchen or bathroom. Eggshell paint gets its name from its sheen that is similar to an eggshell. It is similar to flat paint but has a little more luster. Eggshell paint is easier to clean, which means you can use it in a high traffic area like your living room or your hallway. Eggshell finish will look great regardless of the color you apply it on. If you want something that is very easy to clean, but doesn’t look too shiny, consider a satin paint finish. This type of finish is easy to clean but you can damage it if you scrub too hard or use the wrong products. Keep in mind that a satin paint finish will not hide small flaws and imperfections on your walls as well as a flat finish. An eggshell finish would be a better option if you want a compromise between something that will hide flaws and is easy to clean. A satin finish would be ideal for your kitchen, bathroom or for your children’s bedrooms. Semi gloss paints are another option to consider. This type of finish reflects more light and looks great on trims and borders. Because it doesn’t absorb water or humidity well, semi gloss paint is ideal for kitchens and bathrooms. This type of finish is quick and easy to clean and could be a great option for a playroom. This type of finish usually looks best with a lighter color. You will get the most sheen with a gloss finish. This type of finish is your best option if you want something easy to clean. Gloss finish is often used for painting trim but most people won’t paint an entire wall with this finish. This is also a common option for painting cabinets. Keep a few things in mind when comparing paint finishes. A paint with more sheen will be more durable. Prices usually reflect the quality of the paint and the best option depends on your personal preferences. Choose the best quality paint for your budget, make sure it will be easy to clean and ask yourself if you need to cover flaws and imperfections on your walls.